Oh boy! 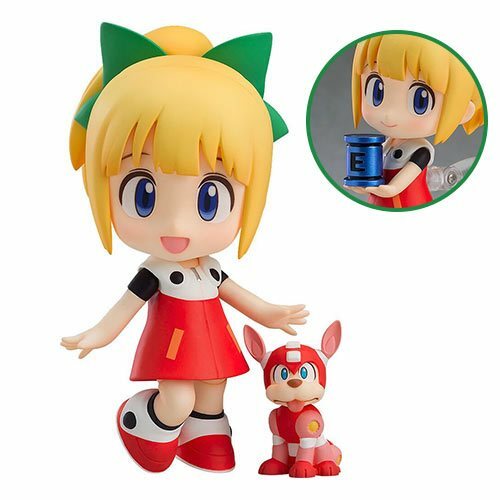 A Nendoroid of Roll wearing her get-up from the Mega Man 11 video game! Mega Man 11 commemorates the 30th anniversary of the series, and Roll celebrates with a new outfit in this totally adorable 4-inch tall Mega Man Roll Mega Man 11 Version Nendoroid Action Figure. She comes with three face plates: a standard expression, an upset expression, and a proud smiling expression. In addition, Roll brings a Nendoroid-sized version of Mega Man's reliable companion Rush, based on original designs for the 2018 game! She also comes with a stand, her cleaning device, and an E Tank as optional parts you can display with her. How fun! ages 15 and up.